Skokie IL – Midwest Media Now! That’s right we’re back! To kick off the new season of Midwest Media Now I’m starting off with some shows I recorded last year. Even though some time as past since producing some of these episodes the conversations are relevant to what’s going on in new media. In this episode I talk with Karen and Frances. They are working to bring a community together with photography and social media to help build out it’s historical archive and start conversations and share stories about what life is like in Skokie, IL. What’s great about what they are doing is this can be done anywhere by anyone. Frances and Karen are passionate about their community and wanted to put the tools together to make it easy for the rest of their city to share it’s history and open it up to everyone. This is perfect example of social and new media working together to build something great for future generations. We talk about the tools they use, and the hoops they are still jumping through to get the word out and get people talking about Skokie. Tell us what you are doing for your town. 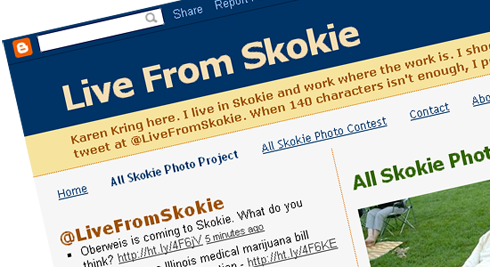 We Are Skokie on Facebook. Some tools you might be able to use to build you’re community and tell stories. Maybe there’s something in your town or you can use Patch to start you’re one local newspaper.